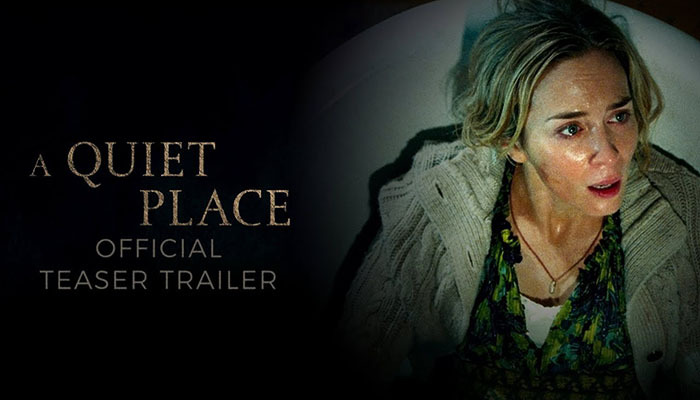 A Quiet Place is an upcoming horror/thriller directed by and starring Jon Krasinski (moslty known from The Office). It was written by Krasinski, Scott Beck, and Bryan Woods. It also stars Emily Blunt, along with some child actors. First off, the movie looks really freaky and very good. I saw the trailer on Saturday night when I went to see Justice League and really liked it. The important thing to note here, is that the, "Spores," track (Here it is on youtube) from the Alien: Covenant soundtrack was used!! Haha, I satup in my seat when it started because I thought there was a TINY chance that a surprise Alien tie-in movie was being teased. Definitely not, but it really made me appreciate (even more so) how creepy that part of the soundtrack is! I noticed that. This movie gives me a "It Comes At Night" vibe, which was a bad case of misleading advertising. Oh yeah! That's a good comparison, joylitt! I loved It Comes at Night and was really mad at how it was marketed. Lot of the audience that it was really boring because they expected a in your face action-y horror. Marketing for Hollywood movies nowadays kills me. Another thing that might not help this new movie is Emily Blunt looking almost exactly as Jennifer Lawrence in "Mother!". The premise is very intriguing though. Eesh, you're right. I didn't see that. The box-office/popularity already looks kind bleek for this, damn. It is a nice track. I don't notice much during the movie since it enhances the scenes. I appreciate in general that it shows how bland a movie could be without a good soundtrack.